Yes the cuckoo was heard on Tuesday, fantastic as they are reducing in numbers. We have our first water lily of the year in flower and are expecting the beautiful array that we experienced last year on all ponds. 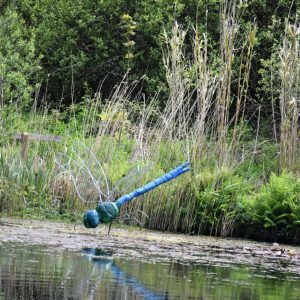 There is a new carving, the Tanglewood Blue, at 5′ 6″ we think this is the largest dragonfly in Cornwall !! The wood is now 90% in leaf and looking fresh and green, we continue to plant in the woodland and in the garden, always finding something we have not got yet.! !